The following breweries are those that I am currently researching. Some are essentially finished, but are frequently updated when additional information is uncovered or images of collectibles are found. Others are still in the early stages of research and composition. Your input is not only welcome - it's encouraged! 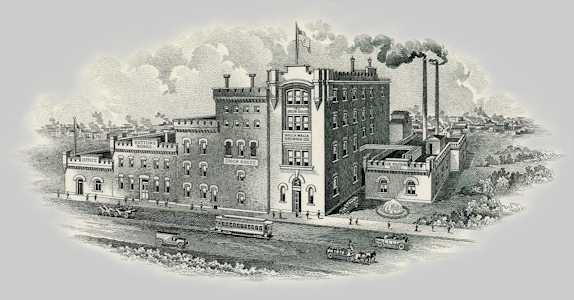 Centennial Brewery (1876-1918) of Butte, MT. Olympia Brewing Company (1902-2003) of Tumwater, WA - founded as the Capitol Brewing Co. (1896-1902). Bellingham Bay Brewery (1902-1916) of Bellingham, WA. Whatcom Brewing & Malting (1899-1903) absorbed by the Bellingham Bay Brewery. Salem Brewery Association (1903-1943) of Salem, OR. Port Townsend Brewing Company (1909-1916) of Port Townsend, WA. Acme Brewing Company (1906-1954) of San Francisco, CA. Breweries of "The House of Hemrich"
Bay View Brewery (1883-1919) of Seattle, WA - part of the Seattle Brewing & Malting Co.
Albert Braun Brewing Assn. (1890-1893) of So. Seattle, also part of Seattle Brewing & Malting. Claussen-Sweeney Brewery (1883-1916) of Georgetown, main plant of Seattle Brewing & Malting. Seattle Brewing & Malting Co. (1893-1916) of Georgetown (So. Seattle). Rainier Brewing Co., Inc. (1933-1953) of San Francisco, CA - est. by Louis Hemrich in 1916. Hemrich Bros. Brewing Co. (1897-1933) of Seattle. Aberdeen Brewing Company (1901-1915) of Aberdeen, WA - est. by Alvin Hemrich. Hemrich Brewing Companies (1933-1940) of Seattle. Apex Brewing Company (1934-1938) of Seattle - est. by Alvin Hemrich. Columbia Breweries, Inc. (1933-1953) of Tacoma - est. by Elmer Hemrich. Elmer E. Hemrich's Brewery, Inc. (1935-1940) of Tacoma. Claussen Brewing Association (1901-1915) of Seattle - controlled by the Hemrichs by 1906. Independent Brewing Co. (1902-1915) of Seattle - controlled by the Hemrichs by 1906. Breweries of Fritz & Emil Sick - "The House of Lethbridge"
Century Brewery Assn., Inc. (1933-1935) of Seattle. Seattle Brewing & Malting (1935-1944). Sicks' Seattle Brewing & Malting (1944-1957). Sicks' Rainier Brewing Company (1957-1970). Sicks' Brewing Company (1943-1953) of Salem, OR - previously the Salem Brewery Assn. Sicks' Century Brewery (1939-1957) of Seattle - previously the Horluck Brewing Co.
Horluck Brewery (1933-1939) of Seattle - predecessor to Sicks' Century Brewery. Rheinlander Brewery, Inc. (1938-1939) of Seattle - previously the Apex Brewing Co.
Breweries of Williams Brothers, Inc.
Silver Springs Brewing Co. (1934-1967) of Port orchard (1934-1950) and Tacoma (1950-1967). United Union Breweries (1943-1945) of Tacoma and Walla Walla. Pioneer Brewing Company (1944-1951) of Walla Walla - previously of Aberdeen. Mutual Brewing Company (1942-1944) of Ellensburg. DeLuxe Brewing Company (1946-1949) of Wallace, ID - previously the Sunset Mercantile Co.
Lucky Lager Brewing Co., Salt Lake City, UT (1957-1967) - previously the Fisher Brewing Co.